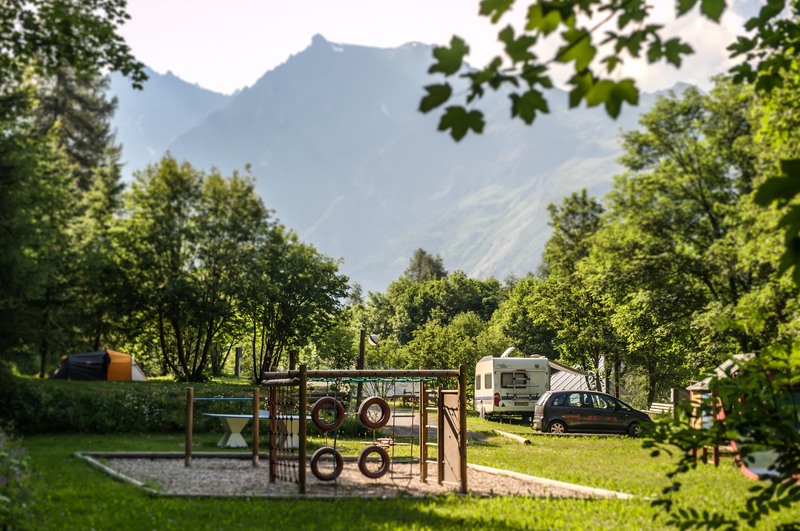 Our campsite is situated at the sunny meadows of the national parc The Ecrins at an altitude of 1450 meters in the calm little village Puy Saint Vincent. In the middle of the nature you put on your hiking boots in front of your tent and you can start hiking right away. Over here camping is what it’s meant to be. 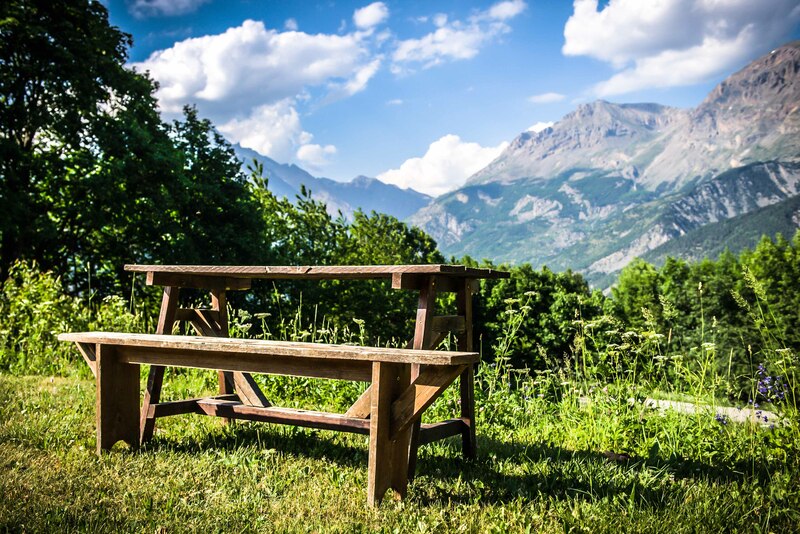 You will enjoy the spectacular views at the rockfaces of the Massiv des Ecrins, it's beautiful valleys and the glacier of Pelvoux. 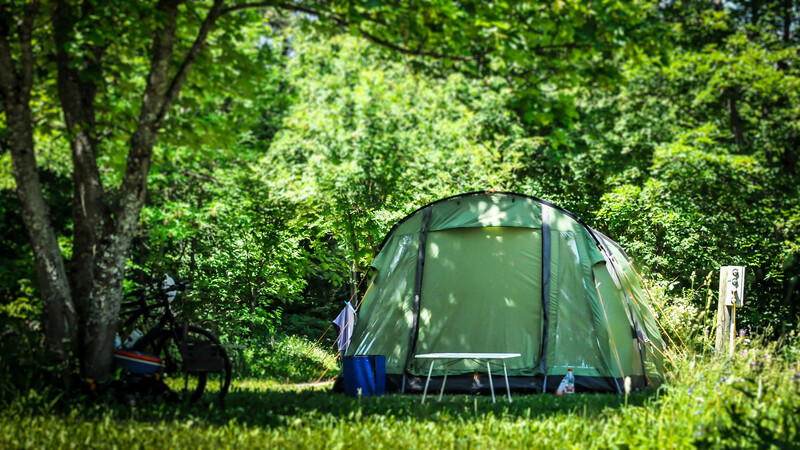 A three star campsite means clean sanitary facilities with hot showers and a good service. 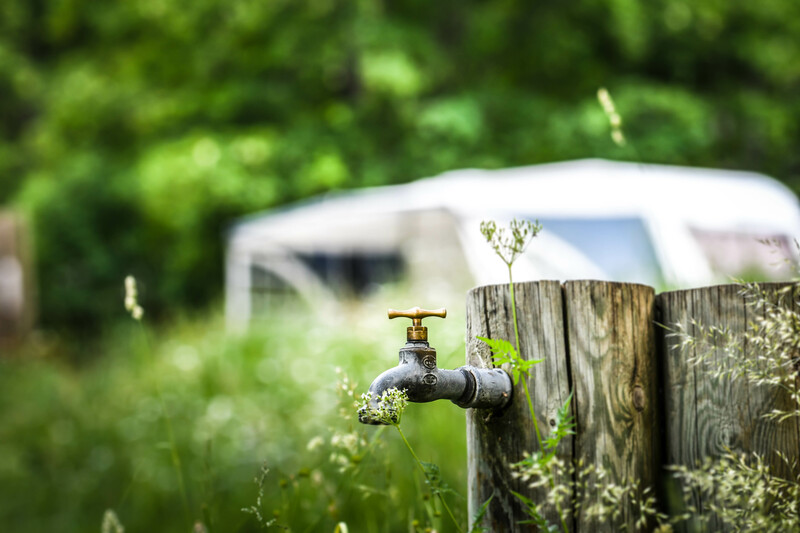 Most of our 50 places have access to electricity and there are several water taps. Every morning we provide fresh bread! 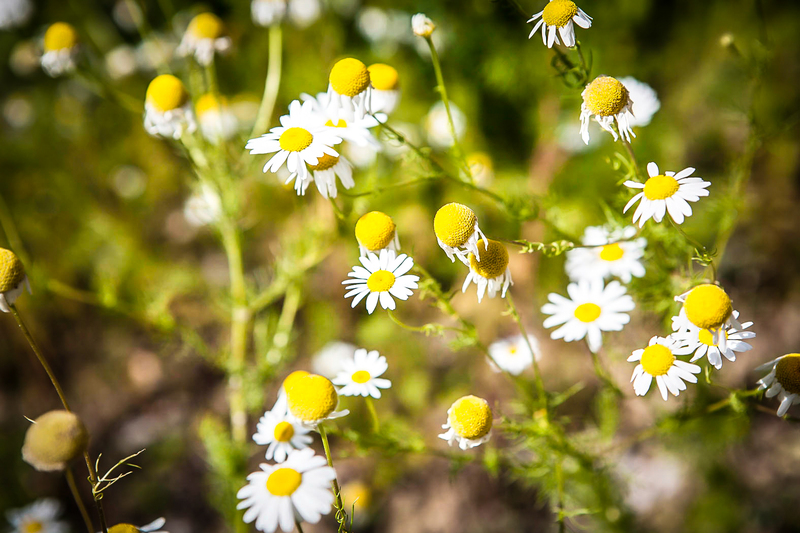 With an average of 300 sunny days per year there is always something exciting to discover. We invite you to come over, so we could show you all the beautiful places. See you in Puy Saint Vincent. We are open from June 1st until September 30th 2019. 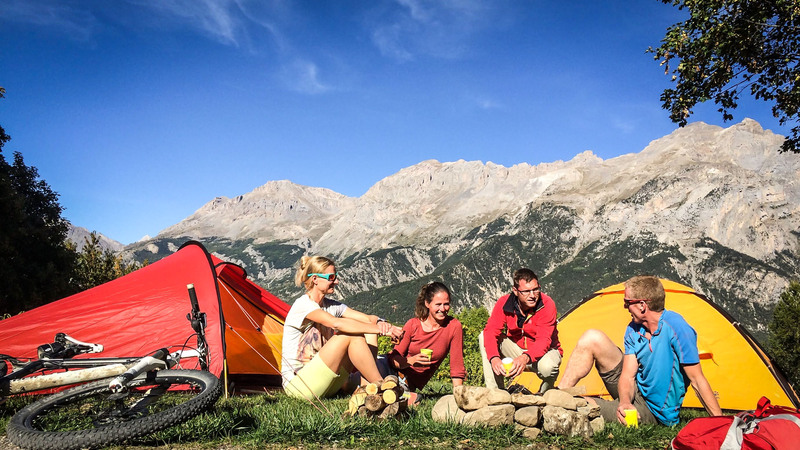 Come and enjoy a beautiful summer in the National Parc des Ecrins! 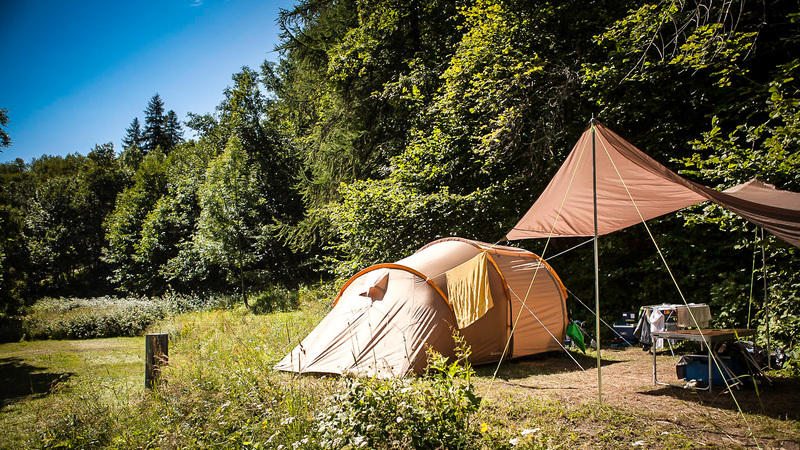 - NEW - in our range is our robust All Season Tent 'Mont Brison'. 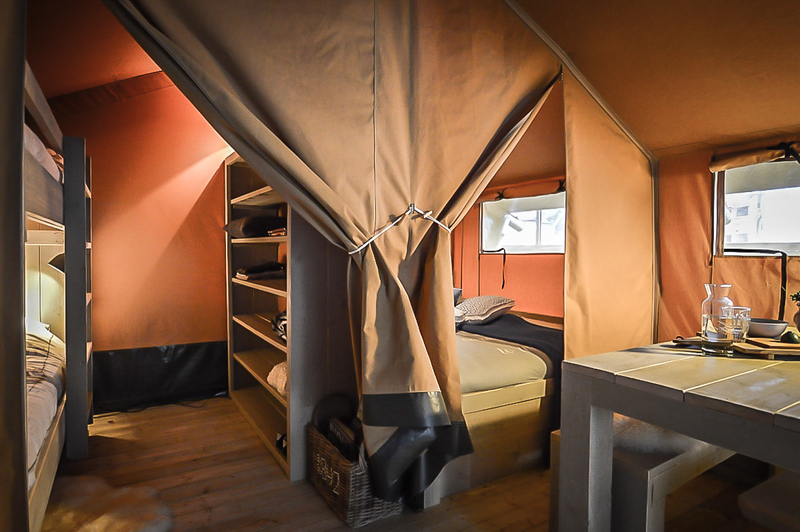 This stylish natural tent gives you a complete camping experience but with the luxury of a good bed, a fully equipped kitchen unit and a generous interior space. 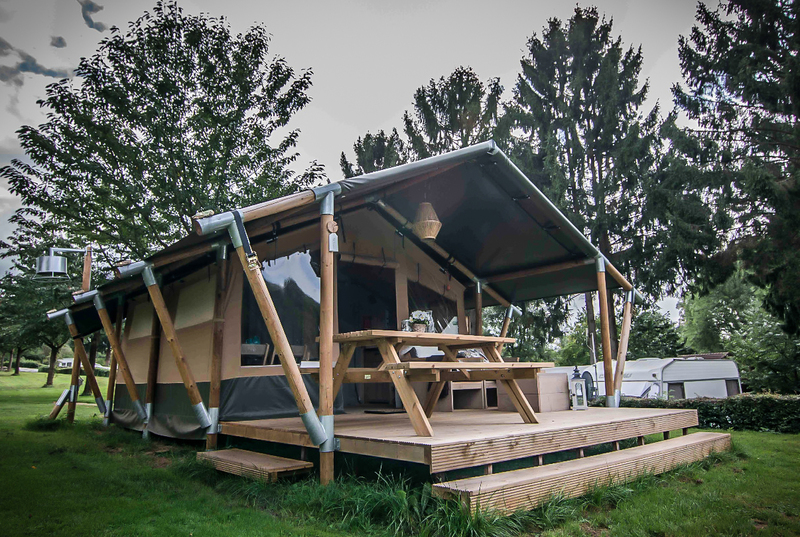 Because of its construction and use of solid round beams, this tent has a tough, robust and natural character. A tent that fits perfectly with our campsite. 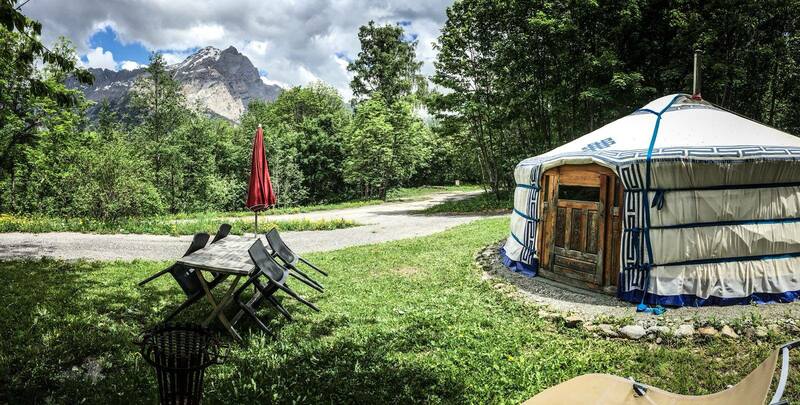 Enjoy the beautiful surroundings 'Les Hautes Alpes' in the middle of nature. 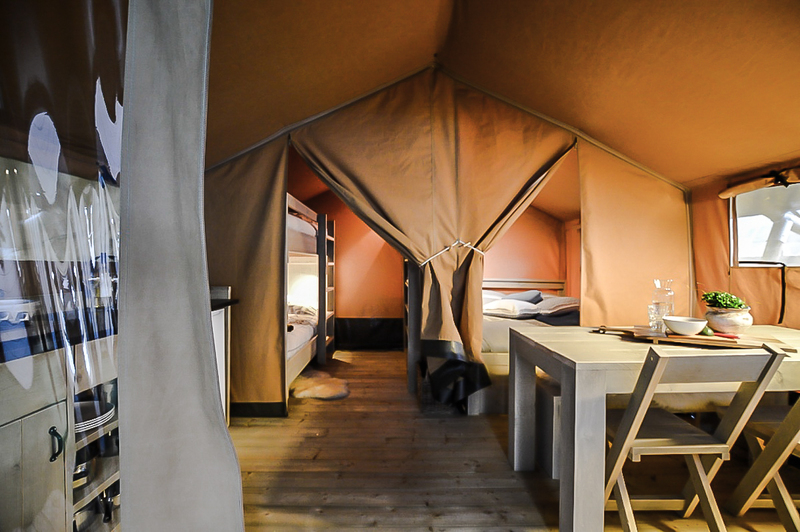 As you might expect at a tent like this, it is fully and neatly furnished. 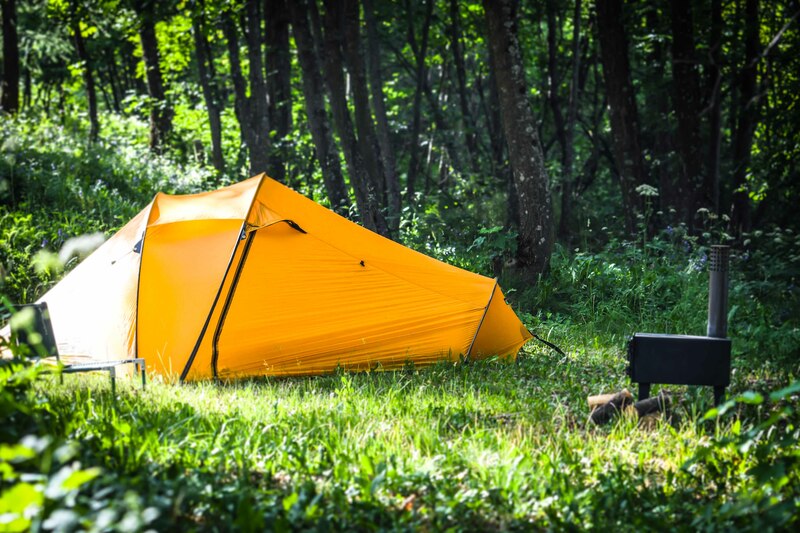 Where the emphasis is still on real camping. 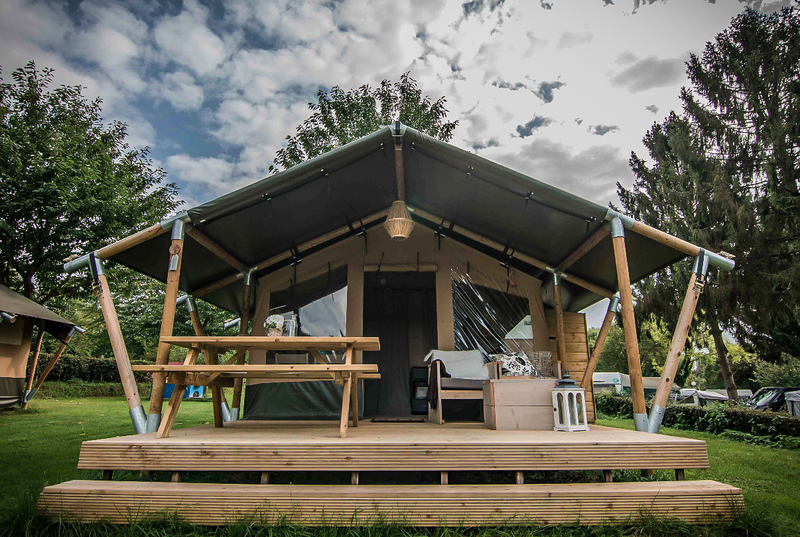 Experience a carefree holiday, thanks to the practical facilities, such as a kitchen unit with full kitchen furnishings, 4 fixed beds with duvets and pillows, a storage cupboard, a spacious living room to eat and an extensive outdoor range including wood stove. You wake up by the songs of birds and fall a sleep with the sound of crickets. Talk about the day by the warmth of a fire stove outside. The place to relax during a comfortable stay. 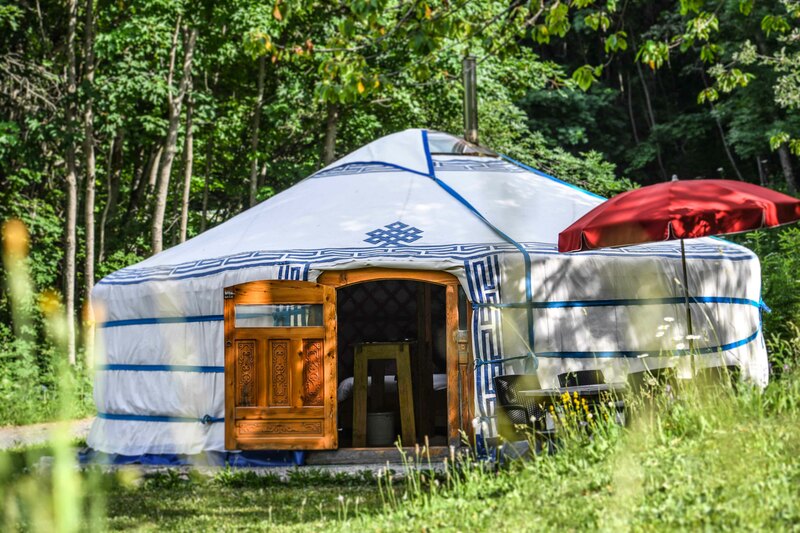 A traditional yurt or ger (Mongolian) is a portable, round tent covered with skins or felt and used as a dwelling by nomads in the steppes of Central Asia. It is a gentle combination of luxury and the basics from being in nature. It fits perfectly with our mountain campsite where we love to life close to the nature. 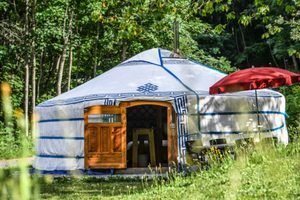 In Mongolia a yurt is named a Ger, what means house or home. A meaningful name for a tent. Being together in a round space does something to you, we know by experience and hear it often of our clients. 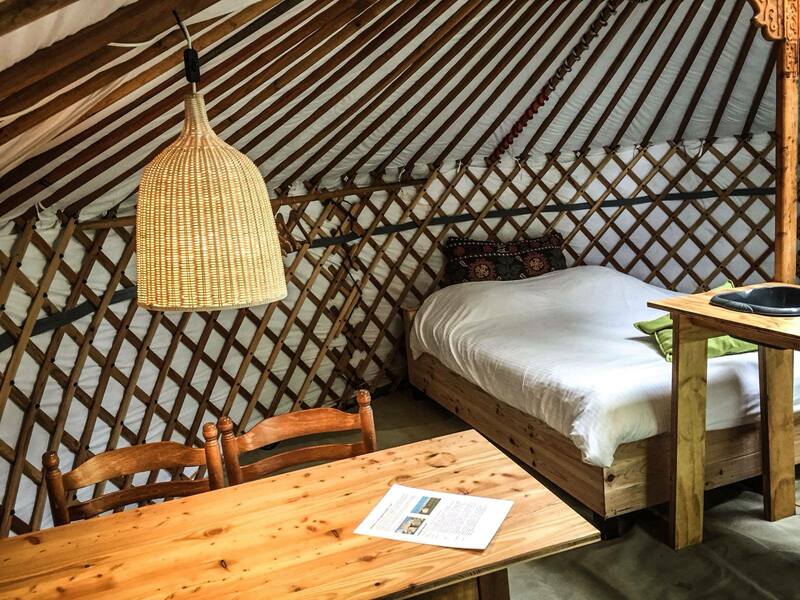 Because of the isolation, the yurt stays cold in summer and keeps the heat inside in spring and autumn. 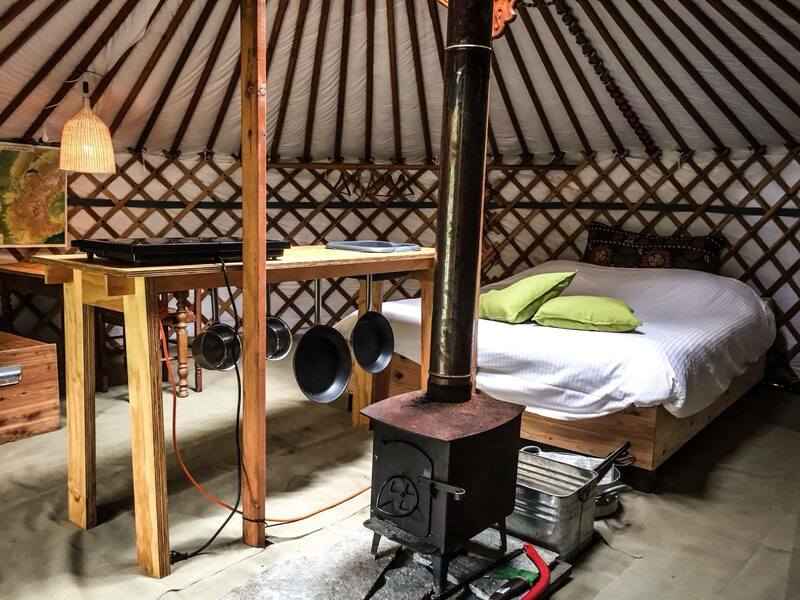 We have one yurt on our campsite, what makes it even more special to stay in this. 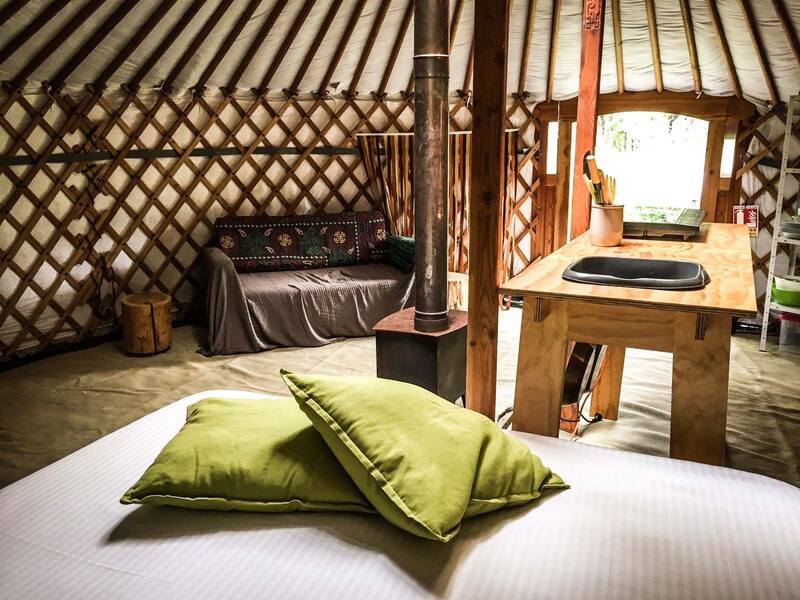 The yurt’s furniture is simple but warm, we have made use of good quality materials. You wake up by the songs of birds and fall a sleep with the sound of crickets. Talk about the day by the warmed of a fire pit inside or outside. The place to relax during a comfortable stay. Hiking. Mountain biking. Road cycling. Rafting. Via Ferrata. Climbing. Puy Saint Vincent is situated in the middle of an outdoor paradise. 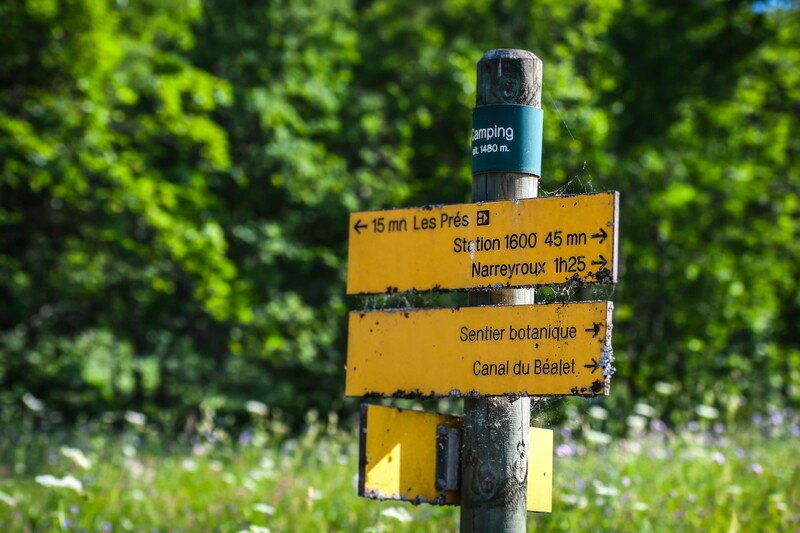 In the sunny part of the Southern France Alpsat the border of the National Parc of the Ecrins and the Queyras, you’ll find lots of hiking, climbing and outdoor opportunities. If you need a rest day or just don't want to be all that active there are three beautifull lakes nearby to swim in or visit the well known weekly market in Vallouise. 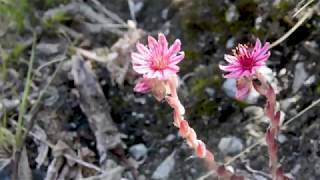 Have a look at the little video and get inspired. Lively. Families. Cosy. BBQ. Outdoorsports. Make your own pizza. 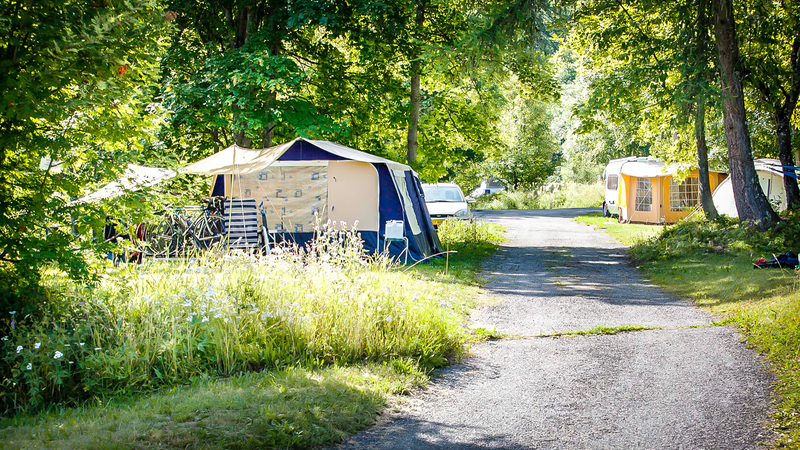 During summer holidays (July and August) there are mainly families on our campsite. Children meet each other at the playground or during our pizza evening. 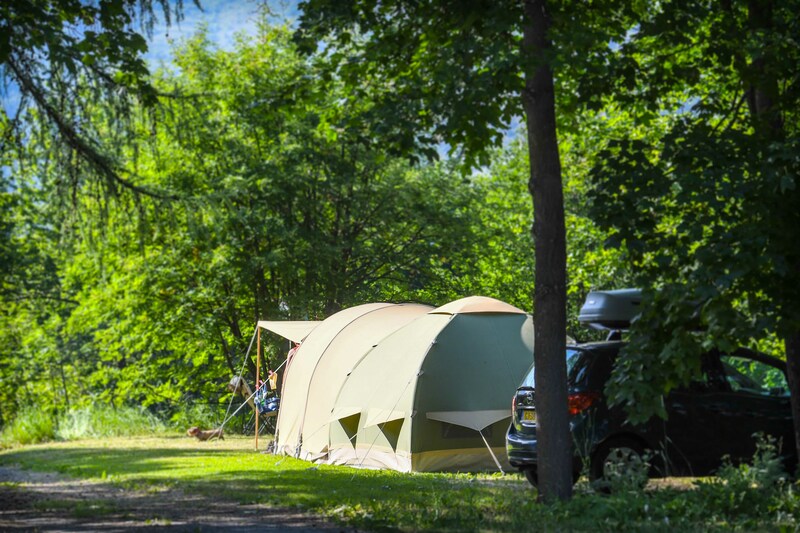 The terraces and the spacious terrain make you feel being in nature and not on a crowded campsite. Every Sunday we have a ‘pot d’accueill’. A drink where you’ll meet other people and the place you could sign up for outdoor activities, organised by the outdoor companies of this area. If you would like to go rafting, climbing, paragliding, canyoning, something for everyone. Every week on Sunday we have our own pizza evening, Here you make your own pizza! We make sure all the preparations are done and a lot of ingredients are at your disposal. 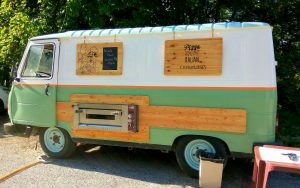 One member off the campsite will hell you by baking a gold brown pizza in 5 minutes. Bon apetit! Space. Silence. Lots of sun. Nature. Flowers. 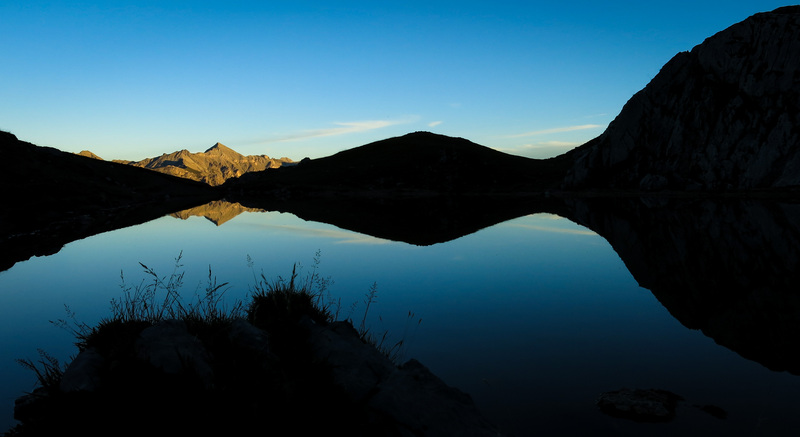 f you like silence and space and listen to the sound of running water, June and September are the months to come to Puy Saint Vincent. 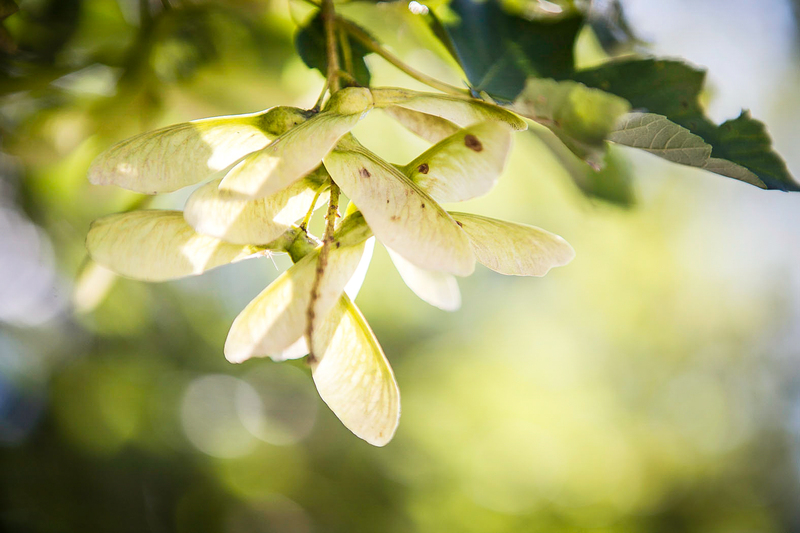 In June the flowers bloom and the nature comes up, in September the leaves of the trees change colour. 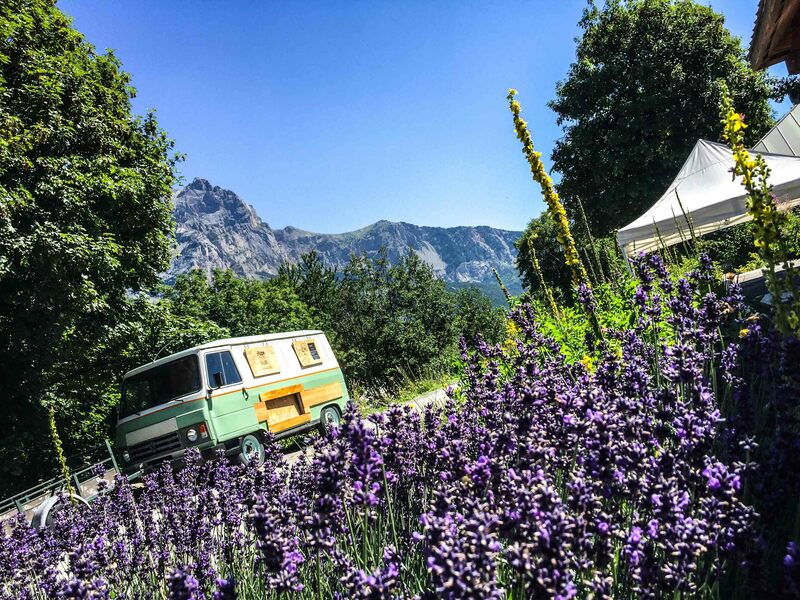 The campsite opens the first of June, spring is everywhere by then. Everything colours green in a quite surrounding. During the day temperatures goes up to 25°C, but during the evening the temperature drops (sometimes even down to zero). For people who like flowers or birdwatchers june is the best period. Almost empty walking trails makes nature even more spectacular. The one thing you must consider is that the alpine walking cols might still be unaccessible due to the snow. The more busy high season starts around the 15th of july till mid august. The Hautes Alps are situated in the Provence Alpes Cotes d'Azur between Gap (to the south west), Grenoble (to the north west) and the Italian border (to the east). 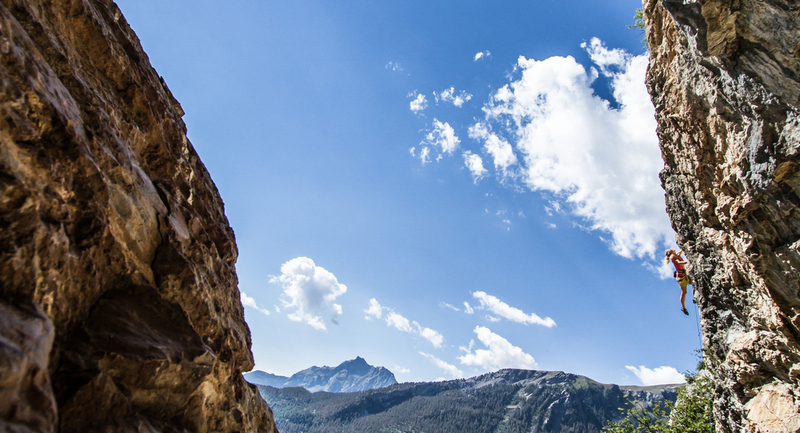 OUr campsite is situated directly at most of the major summer climbing crags. 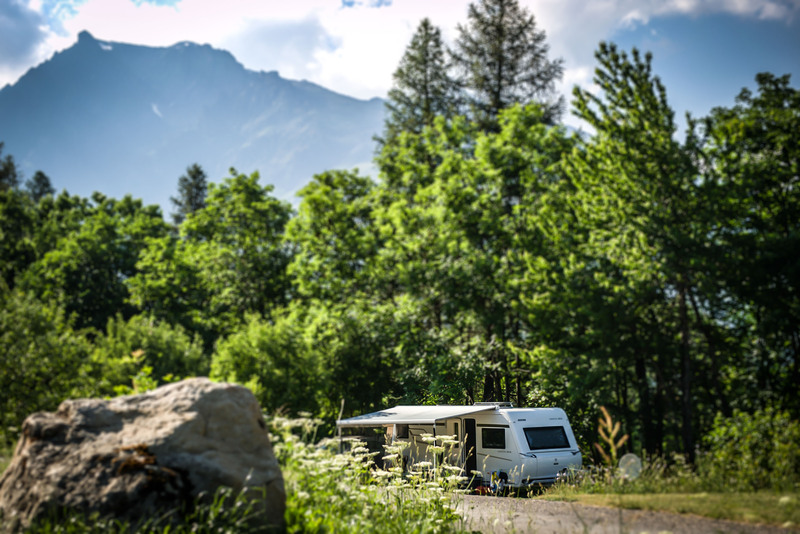 The area is referred as the Southern Alps or the Ecrins and enjoys better weather than the Northern Alps around Chamonix and it is considerably quieter. In fact our area claims to have 300 days of sunshine a year, stays a lot drier, and offers year-round rock climbing by choosing your crag carefully. 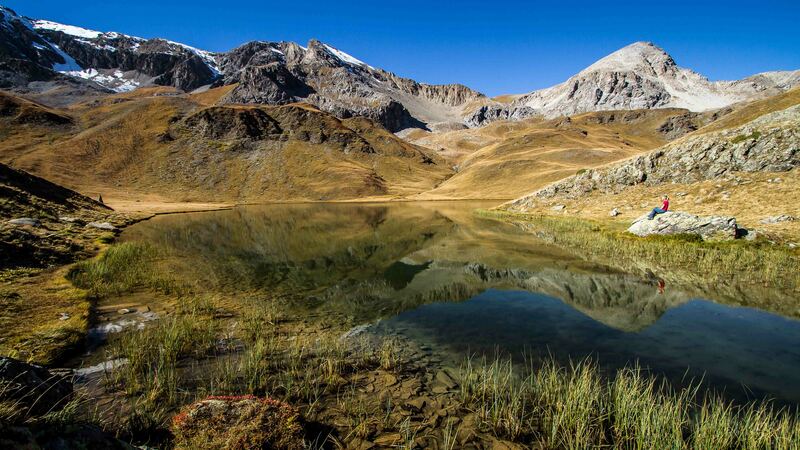 The area is dominated by the 4,000m+ peak of Massif Des Ecrins plus several other 3,000m+ peaks, giving 1,000's of Alpine routes across all grades. There are also around 2,500 sport routes from single pitch to multi-pitch routes up to 600m long - of which the majority are well bolted. 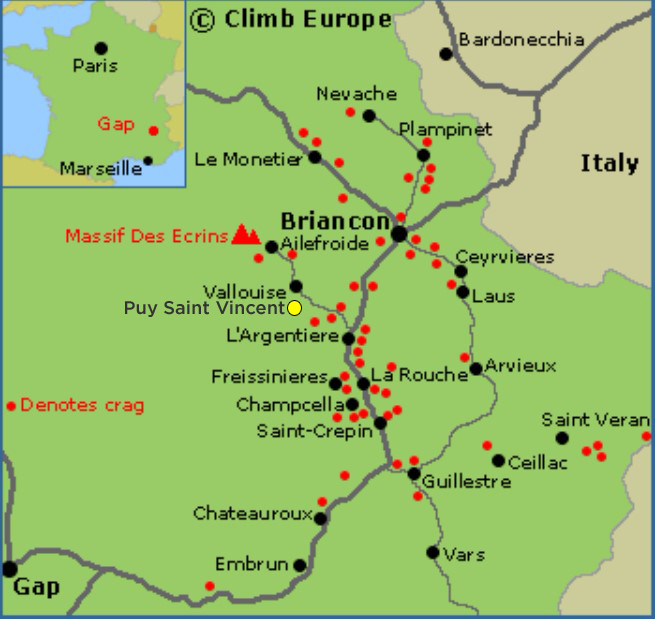 This climbing is mainly situated in the Durance Valley around the towns of Briancon, Ailefroide, Puy St Vincent, L'Argentiere-la-Bessee and Guillestre, and includes over 75 crags. All of these crags have solid rock with a wide choice of grades to choose from. The type of rock here is very varied from limestone, conglomerate, quartz, gabbro to granite and gneiss - offering many different styles of rock climbing. There is also an excellent bouldering area near Ailefroide. The map below shows the major crags in the area and the table opposite shows a selection of the popular crags. The best way to contact us, is by email. We will try to answer within 48 hours. Do you have any questions? Don't hesitate to call us, send an email or fill out the form below.